Trust me, I’ve got nothing again Easter candy. Um, hello cadbury mini-eggs anyone? I don’t mind the kids having a few M&Ms, but we like to have a big ol’ Easter egg hunt with lots of eggs , and the thought of filling all those eggs with candy makes me cringe. I’ve done the whole put one or two M&Ms in each egg thing when my oldest was two. (Come on, you’ve done that too right)? I know he didn’t know any better but I still felt bad. After that we started to mix it up and put a lot of non-candy items into our egg hunts. In case you need a little inspiration to get you started, I’ve put together a short list of some of our kids’ favorite fillers from over the years. Stampers Self-ink Stamps – Kids love these and it gives them something to do later in the day when you need some quiet time. Bouncy Balls – you can often find these at the dollar store or party store. Many times I can find fun character ones at our local party store. Safari LTD Toobs – We love THESE , and THESE . 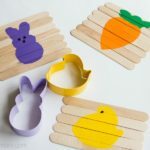 Toobs are my absolute favorite because one Toob can fill 12 eggs (in most cases) and then we use the figures all year long in sensory bins, small world, play and so many other ways. Magic Grow Capsules – I can sometimes find these at our dollar store too! Building Brick Eggs – I love that these are already filled, just hide as is! Marshmallows. Not exactly non-candy, but I had to throw that in there. This time of year you can even find bunny little shaped ones in most stores. What’s the moral of the story? If you want to have a candy-free (or nearly candy free) Easter egg hunt, you can! Just think out of the box (or the egg as the case may be). Check your local dollar store for packages of things like mini erasers, high-bounce calls and other little trinkets. The birthday party aisle often has many goodie bag fillers that would fit inside the larger size plastic eggs. Target is another great place for fun finds; either their dollar spot or again the birthday party aisle. Our local party store has a whole section of goodie bag fillers where you can purchase items separately rather than in multi-packs so check there. Many of those items are small enough to fit in eggs too. What would you add to this list? Let’s inspire each other. Leave a comment with your non-candy easter egg filler ideas and lets see how large we can grow this list! Oh that’s a great idea!